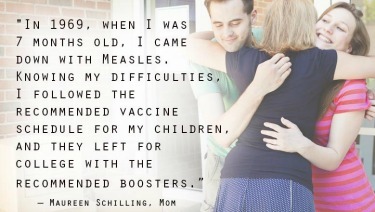 ​​Maureen Schilling never thought twice about vaccinating her children. At 46, the Indianapolis mom has suffered from lifelong asthma, severe and persistent allergies and a weak immune system that her family doctors believe stem from a childhood case of measles and resulting complications. "My husband teases me, 'Every time a germ floats by, you're going to get it'," said Schilling, who has been hospitalized twice for pneumonia. "What I know about it is only what my mother and grandmother were able to tell me—it sounds like the worst possible scenario you could have." At 7 months old, she came down with a high fever, and was "spotted and raw all over and dehydrated," she said. During a lengthy hospital stay, she had a severe allergic reaction to an antibiotic, which resulted in anaphylaxis, a life-threatening condition. She had stopped breathing before she was given a shot of Epinephrine to counteract the reaction. At age 4, she had her tonsils and adenoids removed and tubes put in her ears. Meanwhile, her sister, who had all the vaccinations available, including the measles vaccine, was a much healthier child, she said. Her experiences shaped her view on vaccines, prompting her to keep her children up to date with immunizations. Her daughter, 20, and son, 23, left for college with the recommended boosters. Schilling worries about how easy it is for diseases to spread worldwide. She fears the consequences if people stop vaccinating their children.